It’s a scene that’s becoming far too common. Wandering around barren, iceless rocks, a polar bear searches his home aimlessly for food. Eventually, he stumbles upon a lone plastic bag. He grabs the bag and sinks his teeth into it, pulling it apart in hopes of finding food inside. This bear lives in Svalbard, a Norwegian archipelago in the Arctic Ocean hundreds of miles away from the mainland. But somehow, our litter is making its way there. That’s the shocking realization that hit photographer Fabrice Guerin as he captured these photos on a recent trip to the islands. He hopes they will show how far-reaching litter really is. In addition to the bag featured in his photos, Guerin also noticed littered plastic bottles and bags in many other areas of during his trip. 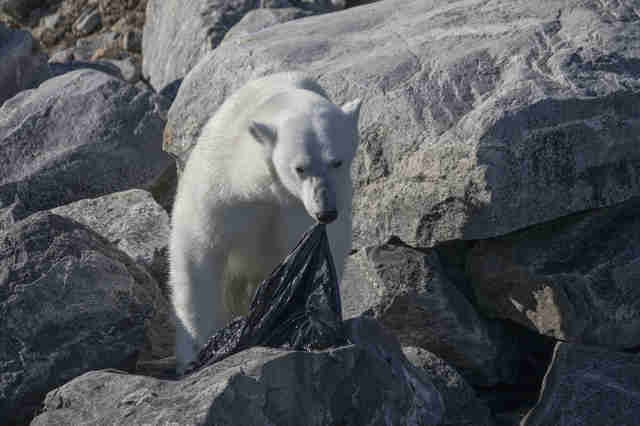 Just last month, a family of polar bears from the same island chain was spotted playing with a large piece of plastic debris they’d found among the ice. These stories of animals forced to live among our garbage are alarming to many — and they should be. Roughly 8 million tons of plastic enter the world’s oceans each year, and endanger the lives of both land and sea animals. You can do your part to help by limiting the amount of single-use plastic products you buy, opting for reusable bags instead, and by recycling plastic waste in secure containers. To help fight ocean trash and keep animals safe, you can learn more here. To protect polar bears in the wild, you can make a donation to Polar Bears International.